Show Me Sunday - A Tutorial by Lori M.
FROSTED DESIGNS FALL BLOG HOP! I actually found this idea on-line a long time ago and wish I could remember where I found it since it is such a great project to make, especially this time of year. I have given this as a gift to teachers, my hairdresser, friends and family. It makes a great hostess gift, too! This project does requiring some measuring, so if you have a Scor-Pal or a Martha Stewart Score tool, that would be best. If you have a paper trimmer with a scoring blade, that should also work. 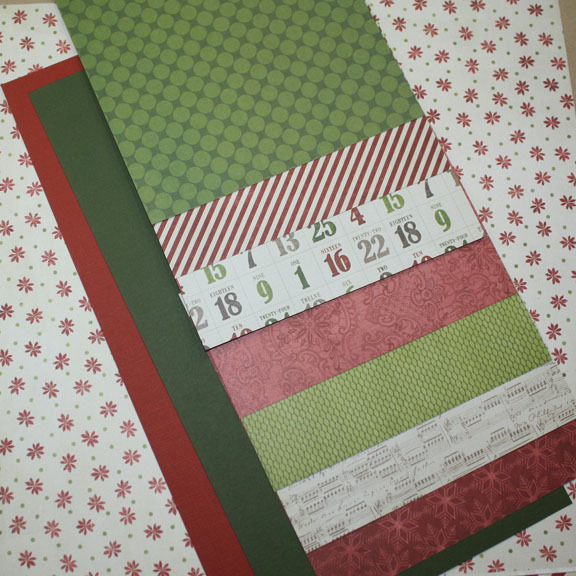 Start with a 12 x 12 sheet of cardstock and cut it in have (you will end up with 2 6 x 12 pieces). Lay one of the 6 x 12 pieces across your scoring tool (12" width along the length of the ruler). Score the first piece at 3", then at 5", then at 10". You should have 4 sections. The first should be 3", the second section should be 2", the third section should be 5" and the last section should be 2" (for a total of 12"). Score the second piece at 5", then at 7", then at 10". You can then cut off that last two inches as you will only need this piece to be 10". Your second piece should end up with 3 sections. The first should be 5", the second should be 2" and the third should be 3". 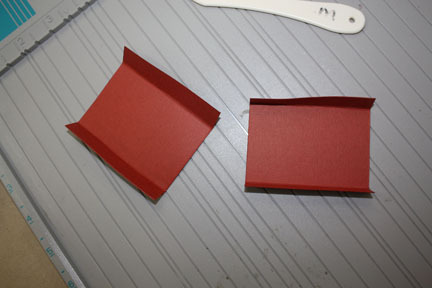 Lay out the first section and put adhesive on the inside of the 3rd an 4th sections. This is the 5" section and the 2" section. Take your second piece (remember that the 1st and 2nd sections are 5" and 2" respectively? Lay them over the section of the first piece that you just covered with adhesive. If your last 3" section is hanging freely, you've positioned your sheets correctly, so press the 5" and 2" section together. Now you should have one long 6" wide sheet with 5 sections. 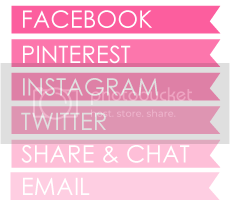 The first section should be 3", then 2", then 5" (double enforced), then 2" (double enforced), then 3". For going forward, remember that the 2" reinforced section as per above will be the bottom of your box. The 5" reinforced section will be the back of your box. For the next step, you will need another sheet (or scrap) of the same cardstock, at least 3" by 6". Cut to 2 3" square pieces. Score each piece at 1/2" and 2 1/2". This should leave 3 sections, 1/2", 2", 1/2". These will be your side pieces. 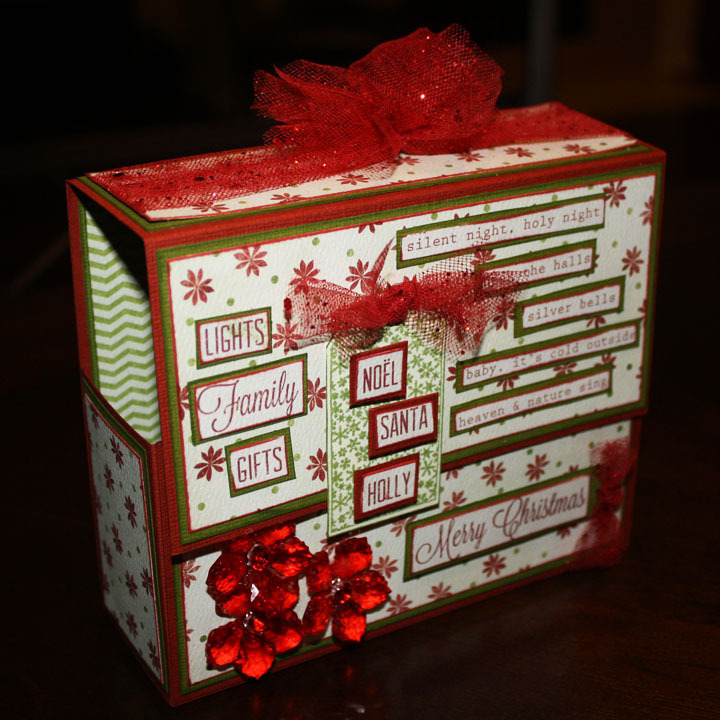 It is easier to decorate each section of your box BEFORE you put it together. I decorate each section separately with a mat ad decorative paper on the inside and outside of each section. Besides looking really nice, the multiple layers really add reinforcement to the box. Cut your mats 1/4" shorter than the box sections (both height and width...example, 2 3/4" by 5 3/4" for the 3" x 6" section). 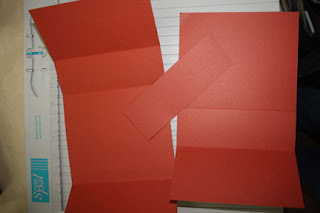 Reduce the size of each section by a 1/4" again for the decorative paper (both height and width...ex. 2 1/2" by 4 1/2" for the 3 x 6 section). 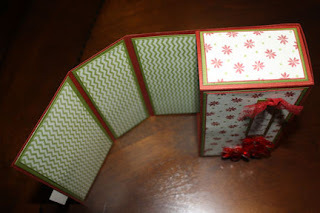 Before you place your decorative paper on the bottom front of your box (the lower 3" by 3" section), adhere one half of the magnet set on the middle/top of the outside of the lower front of your box about a 1/2" down from the top of the section. Place the other half of the magnet on top of the magnet you just attached and position the upper front of your box on over the lower front section and once positioned, squeeze the pieces together so that the outer magnet attaches to the upper front section of your box. Place adhesive on the outside of the 1/2" sections of each of your side pieces. Now, it's time to assemble the box. Hold up the 3" section and the 5" section of your box with the 2" reinforced bottom on the table. Carefully position your 3x3 pieces in between each side of your box (adhesive on the inside edge of each 3" section and 5"section (first 3" up). You should now end up with a 3" section on the lower front of your box, a 2" reinforced section on the bottom, the 5" reinforced section to the back, another 2" section on the top, and a 3" section that will become the upper front section (flap to close the box). If you also want to decorate the inside of your box, you should do so now. Once your decorating is completed, you can make coordinating cards (5 1/2" by 4 1/4" cards) and place them in the box along with some envelopes and you are ready for gift giving. What a great idea! And you make it look so easy! Thanks for the great directions! great tutorial and awesome project! Wow - what a great card box!! Thanks for the instructions!! This would make a great teacher gift!! !